Traveling to the Finca can be a little adventure, please read the following carefully. Then take a taxi from airport to the harbor of Los Cristianos (costs app. € 25,-). We do not recommend the airport bus, because it does not arrive/leave at the harbor directly. Olsen Express: ca. 45 min. Updates schedules and prices you find on Fred Olsen website. Naviera Armas: ca. 55 min. Updates schedules and prices you find on Naviera Armas website. Olsen Express: ca. 50 + 70 min. Updates schedules and prices you find on Fred Olsen website. Naviera Armas: ca. 100 min. Updates schedules and prices you find on Naviera Armas website. All information are subject to change. All information are subject to change. Driving time app. 90 min., costs 5 Euro. Updates schedules you find on the buswebsite. 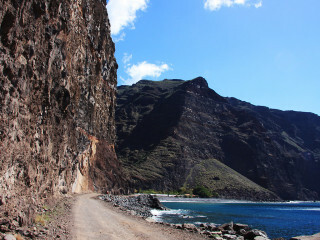 From the bus Station in Vueltas we recommend a pickup through one of the Finca Drivers (Euro 5,-). With luggage the dirt road to the Finca is very difficult to walk! About 1hour 15 min. from San Sebastian directly to the Finca Argayall (€ 65 to € 75, also known als Finca Argaga). If you want to take a taxi, it is best we organize a transfer for you as most taxis do not drive directly here or take an extra fee for the dirt road. 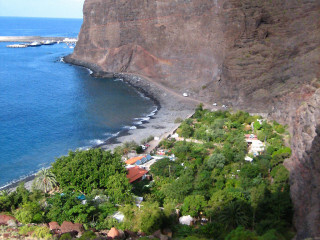 Here are two websites where you find more information about La Gomera.